1774: born in Kamigata. He started his career at an unknown date, performing under the names of Bandô Mankichi and Araki Mankichi. Winter 1796: he became disciple of Arashi Kichisaburô II and received the name of Arashi Kankurô I. Fall 1800: he went to Edo, along with Sawamura Sôjûrô III, Sawamura Gennosuke I, Fujikawa Buzaemon II and the playwright Nagawa Shimesuke I. 11th lunar month of 1800: Arashi Kankurô I took the name of Arashi Kanjûrô I at the Ichimuraza, playing the role of Aratôta in Nagawa Shimesuke I's kaomise drama "Oishigeru Nami no Une Une", which also celebrated the shûmei of Ichikawa Danjûrô VII. 3rd lunar month of 1809: premiere at the Moritaza of Fukumori Kyûsuke I's drama "Sono Mukashi Koi no Edo-zome"; Kanjûrô played the role of Ebina Gunzô [casting]. 1st lunar month of 1814: Kanjûrô played the roles of Tataranosuke and Keian in the drama "Keisei Tsukushi no Tsumagoto", which was staged in Ôsaka at the Kado no Shibai. This was the first performance in Kabuki history of a play based on the "Asagao Nikki" world [casting]. 11th lunar month of 1818: Kanjûrô played at the Minamigawa no Shibai the roles of Motoemon and Mansuke in the drama "Tengajaya". 11th lunar month of 1819: Kanjûrô played at the Kado no Shibai the role of Gonkurô in the drama "Futatsu Chôchô Kuruwa Nikki". Fall 1820: Kanjûrô went to Edo with Onoe Kikugorô III, Nakamura Waichi and Onoe Kikunosuke I. 11th lunar month of 1820: Kanjûrô played at the Kawarasakiza the role of Senoo Jûrô in the drama "Ise Heiji Ume no Mitegura", which celebrated the shûmei of Onoe Tamizô II, Ôtani Monzô II and Iwai Kiyotarô IV. 26th day of the 9th lunar month of 1821 : his master Arashi Kitsusaburô I died in Ôsaka. 5th lunar month of 1822: Kanjûrô played at the Nakamuraza the roles of Ono Kudayû, Horibe Yajibê and Ôta Ryôchiku in the drama "Kanadehon Chûshingura". 5th lunar month of 1823: Kanjûrô played at the Nakamuraza the roles of Fujiwara no Shihei, Shundô Genba, Yatôji and Shiratayû in the drama "Sugawara Denju Tenarai Kagami". 3rd lunar month of 1828: Kanjûrô played at the Kawarasakiza the roles of Kawagoe Shigeyori, Sagami Gorô and Yazaemon in the drama "Yoshitsune Senbon Zakura". 11th lunar month of 1828: Kanjûrô played at the Nakamuraza 3 roles in Tsuruya Nanboku IV's drama "Motomishi Hana Otogi Heike"; his yearly salary was 450 ryô. 3rd lunar month of 1829: Kanjûrô played at the Nakamuraza the roles of Sagami Gorô and Yazaemon in the drama "Yoshitsune Senbon Zakura". 11th lunar month of 1829: premiere at the Nakamuraza of Tsuruya Nanboku IV's drama "Kin no Zai Sarushima Dairi"; Kanjûrô played the roles of Yasaka no Jôzô, the sendô Yotsuzuka Daisaku, Iga Jutarô and Ôashi Harashirô [more details]. 1st lunar month of 1832: Kanjûrô's rank in the Edo hyôbanki, jitsuaku section, was jô-jô-kichi (superior - superior - excellent). 2nd lunar month of 1834: Kanjûrô played at the Nakamuraza the roles of Kô no Moronô, Horibe Yasubê and Ishidô Umanojô in the drama "Kanadehon Chûshingura". 3rd lunar month of 1836: Kanjûrô played at the Nakamuraza the roles of Benkei and Yazaemon in the drama "Yoshitsune Senbon Zakura". Summer 1837: tour in Nagoya with Arashi San'emon IX, Ichikawa Ichijûrô I and Jitsukawa Enzaburô I. 1st lunar month of 1838: Kanjûrô's rank in the Edo hyôbanki, katakiyaku section, was kô-jô-jô-kichi (meritorious - superior - superior - excellent). 11th lunar month of 1841: Arashi Kanjûrô I and his disciple Arashi Kanzô respectively took the names of Arashi Izaburô II and Arashi Kankurô III at the Kawarasakiza; the new Izaburô played the role of Haji no Hyôe in the drama "Sugawara Denju Tenarai Kagami". 10th lunar month of 1842: Izaburô took part in the opening ceremony of the newly-built Nakamuraza in the district of Asakusa Saruwaka-chô, playing in the drama "Kinryûzan Chikai no Ishizue", which was produced by Nakamura Kanzaburô XII; his stage partners were Iwai Tojaku, Sawamura Tosshô II, Arashi Kichisaburô III, Onoe Eizaburô III, Bandô Hikosaburô IV, Osagawa Tsuneyo IV and Ichikawa Danzaburô V.
5th lunar month of 1844: Izaburô played at the Nakamuraza the roles of Haji no Hyôe and Shiratayû in the drama "Sugawara Denju Tenarai Kagami". 1st lunar month of 1846: Izaburô appeared on stage for the last time, at the Nakamuraza, where he performed in the play "Nazorae Soga Ôe Yamairi", which celebrated the shûmei of Onoe Baikô IV and Onoe Eizaburô IV. 27th day of the 7th lunar month of 1846 : Izaburô died in Edo. 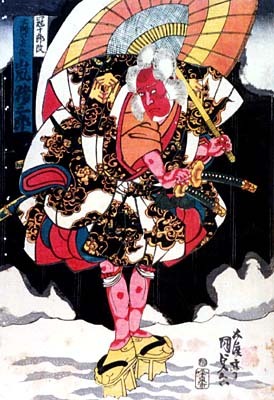 Arashi Izaburô II was a popular supporting katakiyaku and oyajigata of the first half of the nineteenth century. He spent the first half of his career in Kamigata and definitively settled in Edo in 1820, where he achieved fame in the 1830s. The 27th day of the 7th lunar month of the 3rd year of the Kôka era was the 19th of September 1846 in the western calendar.